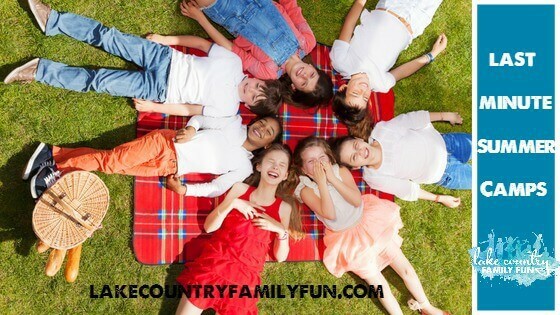 We are a few weeks into summer, and if you are regretting not putting your kids into any programs or camps or if you are just catching up on life, don’t worry – Lake Country Family Fun has rounded up our favorite summer camps that still have a spot for your kiddo! RATES: Please visit www.ymcaatpabstfarms.org/child-care/summer-day-camp/for pricing. DESCRIPTION: The perfect place to fill your summer with excitement! Campers will participate in field trips and activities that promote confidence, character and self-esteem. Whether you come to camp for one week or for the entire summer, we’re sure the friendships you make and the experiences you have will last a lifetime. RATES: Each workshop/summer camp has a different price. See here. DESCRIPTION: Workshops and events are lead by licensed clinical staff trained to work with kids and teens. Gals institute events are focused on building resiliency and confidence. All events require a completed waiver and registration form to participate. See dates and details at galsinstitute.com events page or call 262 337 9770. 2. Cost $185 (includes dancing, healthy snack, crafts and a showcase on the final day for family)! Sibling discounts and multi-week discounts available. 3. Designed for students who are 7 – 12+ and entering our Ballet 1 Division in the 2018-2019 Academic Year or students who have had previous dance experience at another location. For those student coming from another location will be invited to take trial-class to assess if they are ready for the intensive. 1. This summer we are offering our traditional 6-Week Dance Education Program! Our 6-Week Dance Education program is designed after our Academic Year with weekly-classes offered for students in all our divisions … from our Petite Tot Division (parent and me participation class) up to our Pre-Ballet 1 and 2 Division for our older dancers (ages 6-8). Our theme for the Summer 6-Week Program is: A Midsummer Night’s Dream! 2. This is going to be our best summer yet with wondering themes, plenty of twirling, magic and imagination. Our camps are week-long camps (Monday – Friday) from 9:00am – 11:30am. Parents, families and siblings are invited to a tiny showcase at the end of the week so they can showcase everything they learned during a most magical week. Ages of our campers are 3 (must be potty trained) up to 8.​ Now, 8 ​is just a suggested age – as we have had older kids who still believe in magic and whimsy just LOVE every second of their camp experience. It is not a cut-off – just a suggested age. Summer camps are offered at the Downtown Delafield location only. Our theme offerings this summer are: Cinderella, Cinderella, Peter Pan, Alice in Wonderland and the Tales of Beatrix Potter! 3. We are over the moon to offer again our Summer Intensive for our older students. For those students who have ‘outgrown’ our traditional Summer Camps we designed a program that will allow them to hone in on classical ballet skills, terminology and technique while still embracing the storybook aspect of our program in addition to some (more subtle) dashes of magic and whimsy! Our Summer Intensive is designed for students who are 7 – 12+ of age and for our students who are entering (or currently enrolled) in our Ballet I Division. Previous ballet experience is required for students who are not currently enrolled in our studio. REGISTRATION: For Summer Camps is open NOW! RATES: It’s only $30 to register and save your child’s spot! We have 3 affordable rates! DESCRIPTION: You’re going to LOVE our FUN, SAFE, and AFFORDABLE Summer Camp hosted in two locations: Delafield and Oconomowoc ! Your child is going to have a blast making new friends, experiencing a variety of fun indoor and outdoor sports, learning/educational activities, and so much more! Your affordable membership includes an incredible amount of activities at no extra cost, check out the list below! DATES: July 23 – August 31 Choose your days and times. DESCRIPTION: Our 6 weeks of summer camp has a roster that includes cool kids with back-to-back activities for fun and learning! Flexible scheduling allows you to choose which days and how many days each week you would like to attend. Our FULL DAY CAMP program is available from 6:30 a.m. to 6:00 pm Monday through Friday. Our HALF DAY CAMP program is available from 8:00 am to 12:00pm Monday through Friday. Each week as we explore a new theme, your camper will be enjoying the great outdoors on our 36 acres of beautiful farmland. There will be plenty of time for games, crafts, STEAM projects, and indoor recreational activities in our brand new facilities! Christian values are a part of everything we do, and your great coaches are taking out the suntan lotion, milkshakes, and rolling out the red carpet for a fun summer in the sunshine with YOU! Call today to schedule a tour 262-404-5092! PRESENTING BEAUTY AND THE BEAST JR. DATES: July 31st, August 1st, 2nd, 3rd, August 7th, 8th, 9th, 10th, and August 14th, 15th, 16th, and 17th. Most of our sessions are from 10 a.m. to 2 p.m. with a couple exceptions which we will tell the students about. Those will be in the evenings. Our performance will be on August 17th at Fox River Christian Church. All welcome. DESCRIPTION: We will be doing Beauty and the Beast jr. And have two options for students. One option is for students who would like to be in a speaking role and come full time. The other option is for students who would only want to be in the chorus and would come halftime. *Only chorus slots are open. Must register by July 1. DESCRIPTION: Camp Whitcomb/Mason is located on 275 acres on the northwest end of Lake Keesus in the town of Merton. Through an unforgettable Day Camp or Overnight Camp experience, campers are able to develop new skills all while enjoying the outdoors! Campers are able to climb the rock wall, build friendships, play new games, and learn through first-hand experiences in our unique spaces, such as our garden and lake. Prices range on project $15-$25. Canvas, wood board and glass. Kids pick the design to follow along with recipe cards. Artist available for help and pre-sketch upon request. Ages 3-99, Children under 10 must be accompanied by adult. DIY projects. Prices range on project $10-$25. Rocks, mini canvas, ceramic figures & pots, small birdhouse and other wood cut out projects. Instructed 2 hour sessions for kids Saturday and Sundays! Check out our online calendar for 2 hour instructed sessions for kids and adults ALL SUMMER. Find more summer camp ideas in our Summer Camp Guide. Please note some camps are full.